Valentine’s Day is just around the corner! 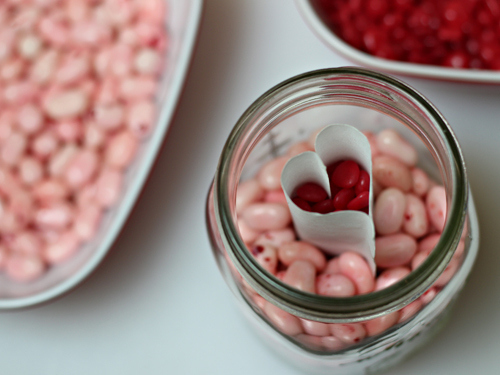 I love all the hearts and any excuse to play with red and pink colors, so I put together a few quick and inexpensive Valentine gift ideas to share with you. What could be better than that? Well, how about if all of the gift ideas are in a jar too? Yes, that’s where I’m going, but that’s still not the best news. I’m holding an awesome giveaway — $100 to spend on your own canning jars, food storage containers and more for making your own food gifts or for canning. Be sure to check the end of this post to enter. Super easy to do and what I like about this is that it’s works as a family gift. I laid Hershey’s Milk Chocolate Treasures (in a Valentine wrapper) in the bottom of a 32 ounce Legacy canning jar. Then, I added the graham crackers to create 4 sides, so I could put marshmallows in the middle. Finally, I finished with more marshmallows. The marshmallows I used are Kraft Jet-Puffed Jumbo HeartMallows. I added a tag and that was it! 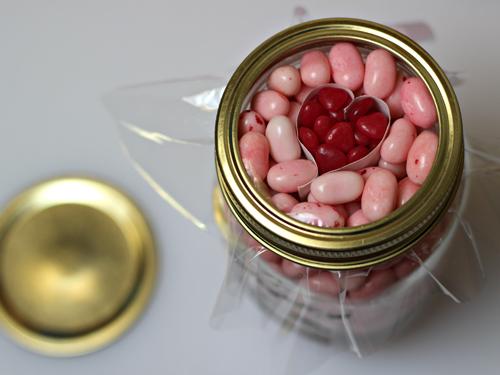 Of course, it’s super easy to put candy in a jar and give it to someone, but I wanted to do something extra special. 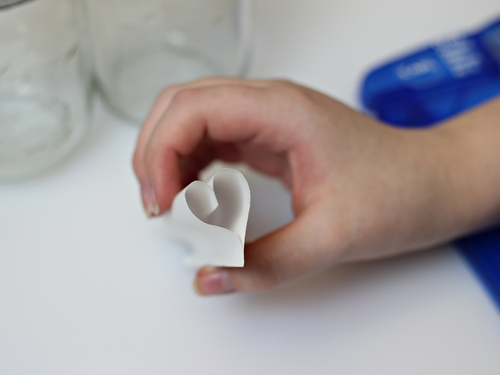 I wanted to create a nestled heart column in the middle of my candy jar. Here’s how I did it. With an 8.5×11″ sheet of copy paper, I cut it in even quarters lengthwise (first in half and then each half in half again). Then, out of these strips, I cut a length of 4.75″. This is the size I needed for the 16 ounce Legacy canning jars, but if you are using something else, you’ll want to measure your jar. 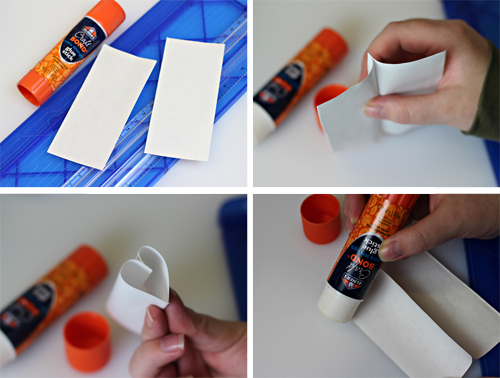 You want the length to fit perfectly from the bottom of the jar to the top edge. Two edges were glued together with Elmer’s Extra Strength Craft Bond glue stick. When dried, I created a heart and determined that I need to also add glue on one of the edges of the opposite side of the paper. The edge I just added glue to, plus the other edge that hasn’t been glued, it brought together with the glued edge to form a heart. Once it is dried, it is placed, standing up, in the middle of the canning jar. Very carefully, the outside of the heart is filled with candy (I used strawberry Jelly Bellies), but while doing that, the middle of the heart is also filled with a different candy (I used cinnamon hearts). If the heart tube moves at all, use a skewer to gently move it back where it should be. Also, filling the heart is easier with a funnel. Fill the candy all the way to the top. 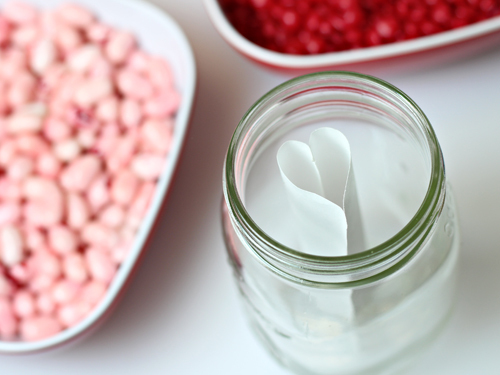 Place a clear cellephane square over the candy and screw on the ring of the canning jars. This will also the nestled heart design to show through. 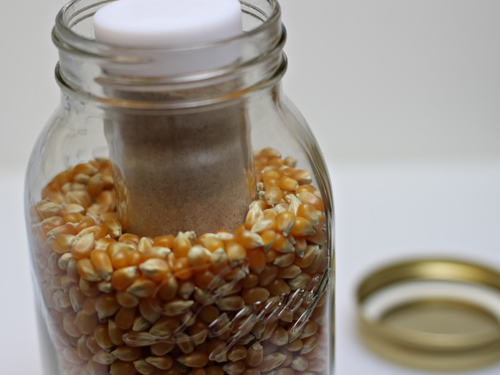 I love this gift idea because it’s so inexpensive and it makes a great gift for someone who either loves popcorn or for families. 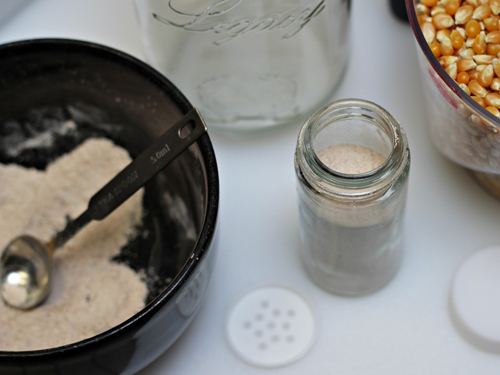 Rather than just filling a jar with popcorn, I decided to go one step further and create a cinnamon-sugar shaker that is nestled within the popcorn. The mixture I created is 4 tablespoons powdered sugar, 4 tablespoons granulated sugar and 2 teaspoons ground cinnamon All this is placed in a small spice jar that I picked up at The Containers Store. 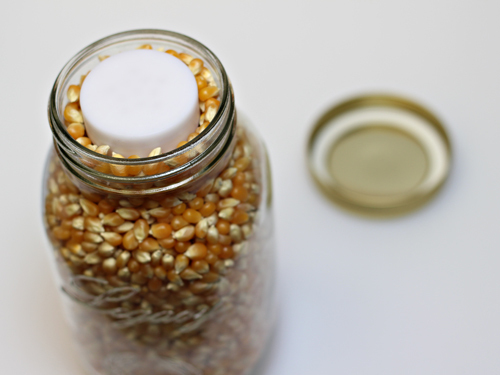 Using the 32 ounce Legacy canning jar, I filled it up about 3/4 ths of the way with popcorn kernels. Then, the cinnamon-sugar shaker is nestled into the kernals. I put it down just enough so it’s level with the top edge of the jar. Once the shaker is in place, I finish adding more popcorn kernals around it. I added a tag, some ribbons and fabric and it’s ready to go! 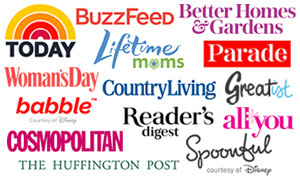 Freund is giving one of my readers a $100 gift certificate to shop in their store! Freund Container & Supply is the largest distributor of glass bottles, containers and wholesale packaging supplies online… Freund offers over 5000 items in stock every day, 98% same day shipping and low-price guarantees. 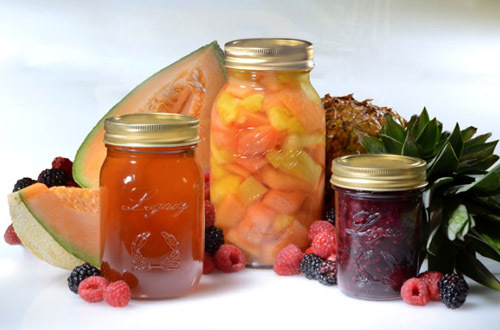 Take a look at Freund’s wide selection of jars, tins, bottles and vials for all your crafting and food related needs! What’s one of your favorite Valentine’s gifts to give OR receive? Or, if you prefer, leave a comment about the gifts in a jar I put together. Giveaway is open to both US and Canadian residents, however, if you are a Canadian resident, please be aware of the following: Canadian residents are eligible to enter the giveaway with Freund but may need to use more of their gift certificate for shipping rates than their US counterparts. This is due to Canadian shipping rates being fairly high because Freund don’t have much volume heading that way. Want another chance to win? My friend, Carolina at 30 Minute Crafts is also holding her own $100 Freund Gift Certificate Giveaway! Head on over there to enter and double your chances of winning. Disclosure: I received product from Freund, and they are providing the gift certificate prize for this giveaway. I love getting a stuffed animal with all my favorite candies. I love your gift ideas – so fun! The nestled popcorn shaker is extra cute. We may have to do it for our teacher gifts! This is the BEST giveaway – my entire pantry is full of glass storage jars, and I am dying to convert all the mismatched jars in my spice rack to one type of glass jar, so crossing my fingers! I love the s’mores idea! My favorite gift to give is Valentine’s “puppy Chow”. 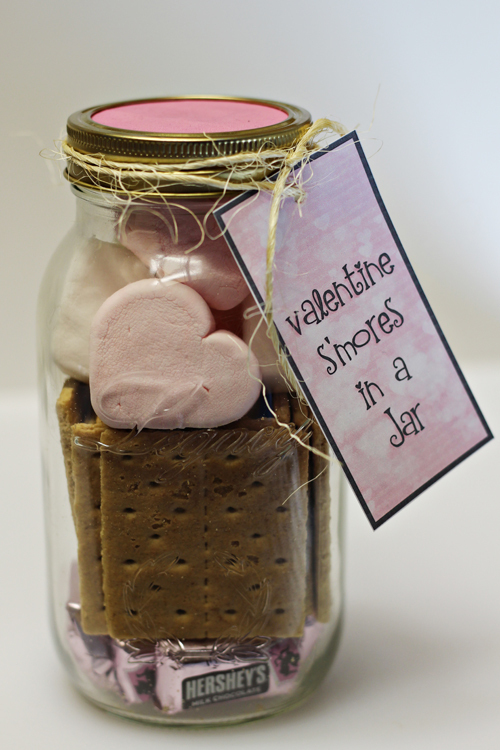 I really like the smores in a jar idea for valentines day. i think it would make a perfect teacher gift. I love giving and receiving homemade jar gifts. Yours are lovely too. Those jars are great and can be used for so many things. A handmade Valentine from a friend is my favorite to both give and receive! I think when it comes to Valentines Day, sometimes the best gift you can give is the kind you can’t touch or taste. As a young single gal, I enjoy giving the gift of encouragement, particularly to other singles. Valentines Day can be a hard time of year for single people – maybe they feel alone or down because they don’t have that special someone in their life. As such, I like to host a Single Ladies Night out every year for my single girlfriends and I. We dress up nice and go out to eat somewhere special, then we go back to my place to watch a movie or do something else entertaining. Not only is it a lot of fun, it’s encouraging for everyone, myself included. I love to get any kind of chocolate! I love giving “gifts in a jar” – thanks for the great ideas. I love getting flowers for Valentine’s day – especially a bouquet of multi-colored roses. I Definitely love the S’mores in a jar gift the best. Very creative indeed. My favorite Valentine’s Day gift would have to be the homemade valentines my kids made for me & their dad when they were little. I love getting gifts but also giving them! My favorite thing to get for Valentine’s Day is a homemade card. I love the candy hearts! 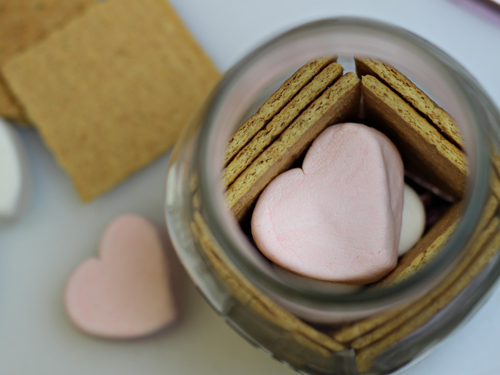 The Smores in a Jar idea is super cute. Love it! I would love that as a gift for myself! my favorite gift i was given was an entirely full huge box of baked goods from this amazing bakery in town, such a bad diet but SO amazing! These jars are awesome. Neat idea. I love to get flowers. 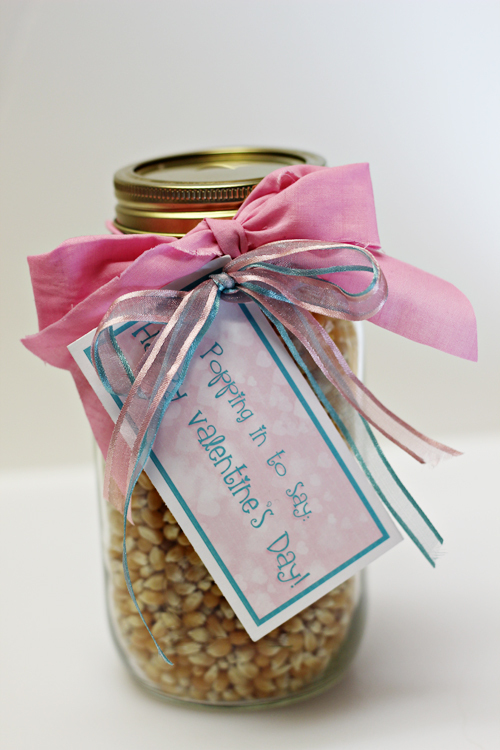 Love the ideas…..especially the first one of three jars….I will be making these for my grandchildren! thanks for the inspiration! These are so cute! I always love to make a special dessert or dinner for my valentine. My dh goes out of his way to find my favorite sugar free chocolate. I think I am going to show him this article as a hint for next year. The jars look so yummy. I love the smores gift idea! My favorite was a year of dates in a bag! Love your jars!! Love them! Has my mind turning for grandchildren gifts! I love love love your popcorn idea especially. I adore getting really good Belgian chocolate. Or massage certificates. Just not flowers – my cats eat them! I’m a traditionalist and still love to get flowers on Valentine’s Day! 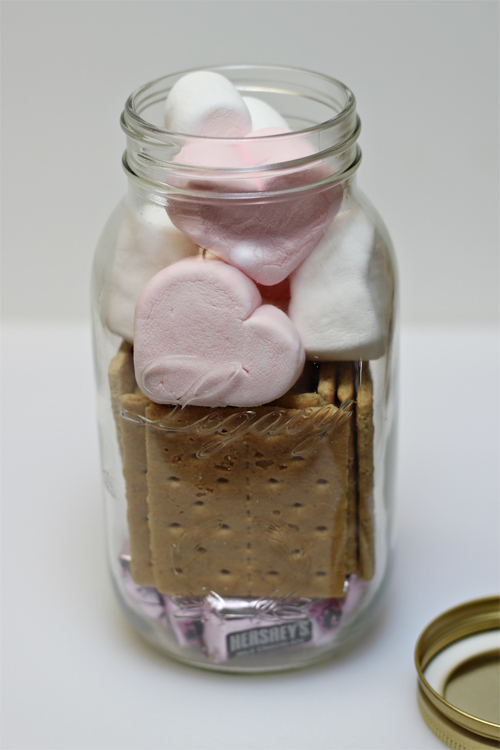 I love the S’mores in a jar idea. So cute! I like to make something chocolatey for my husband on Valentine’s day. I’ve made brownies, truffles, cupcakes, chocolate-chocolate chip cookies. He is as much of a chocoholic as I am so he loves this type of gift. I like to can, so would love to win this. Thanks! If I could get my hands on a plastic jar, this could definitely be an option to send to my deployed husband for Valentine’s Day! I love to give and receive chocolate! But I will be adding your popcorn idea to my list this year, so cute! How cute are these jars! Absolutely love them, thinking about using this idea for my valentine! I’m definitely a giver when comed to gifts, I love see my fiance reaction when I get him something! i love to get chocolate.